Final Design: Pathfinder Systems fabricated a flat roof sound enclosure with 1/8’’ thick aluminum walls and a 5,000 CFM fan. 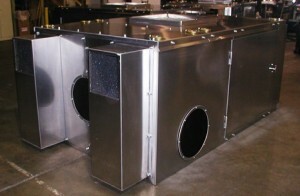 Airflow in the enclosure is directed in a Z-pattern through baffled air inlets reaching from the floor to roof. The design achieved flow of 1,000 FPM. This airflow pattern allows the enclosure to maintain a cooler interior temperature which prolongs the equipment’s lifetime. A single removable door panel allows easy access to the equipment for maintenance. The enclosure’s exterior panels bolt together using zinc-plated steel weld nuts and contain corner mounting holes for skid mounting. EPDM rubber, which is excellent for high temperatures, surrounds the compressor pipe. An internal light bracket allows improved visibility within the enclosure to assist with repairs and maintenance of the equipment. 2.75’’ polyurethane sound attenuating foam, resistant to heat and oils, provides maximum absorption efficiency inside the enclosure.